X-ray surface brightness map of our best model (mass ratio 1:6) in the Chandra energy band 0.8-4 keV. The projected isodensity contours of the total mass distribution are shown in white. The box size is 1800 kpc. The sub-cluster moves from the left to the right of the image with initial velocity v ~ 2600 km/s (in the center of mass rest-frame) and impact parameter 150 kpc. The image is projected along an axis perpendicular to the collision plane and the selected snapshot is the one which most closely matches the observed distance between the centers of the total mass distributions, associated with the two clusters -- about 720 kpc -- once the sub-cluster has passed through the core of the main system. The present velocity of the sub-cluster dark matter component is ~ 3100 km/s and the bullet is actually unbound from the main cluster. The projected offset between the X-ray peak and the associated mass density peak is 172 kpc and 185 kpc in the case of the main and the sub-cluster, respectively. A not negligible fraction of the X-ray emission visible at the present time near the center of the main-cluster is actually associated with hot gas stripped from the external regions of the bullet. The "Bullet Cluster" (1E0657-56) represents one of the most complex and unusual large-scale structures ever observed. Located at a redshift z = 0.296 it has the hightest X-ray luminosity and temperature of all known clusters as a result of overheating due to a recent supersonic Mach M ~ 3 central encounter of a subcluster (the bullet) with its main cluster. 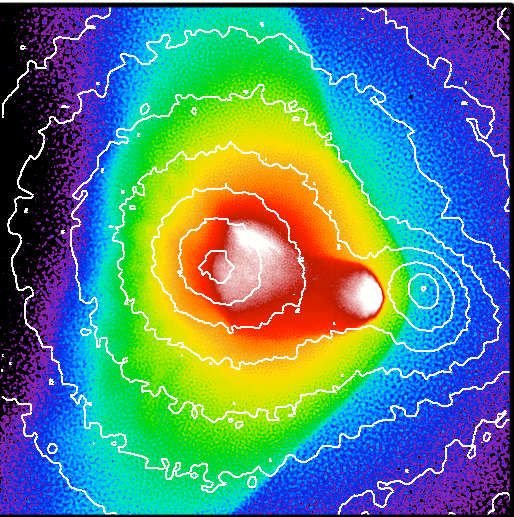 The 500 ks Chandra ACIS-I image of 1E0657-56 shows two plasma concentrations with the bullet cluster on the right of the image being deformed in a classical bow shock on its western side as a result of its motion through the hot gas of the main cluster. The analysis of the shock structure leads to the conclusion that the bullet is now moving away from the main cluster with a velocity of about 4700 km/s. The line-of-sight velocity difference between the two systems is almost negligible suggesting that the encounter is seen nearly in the plane of the sky. As the core passage must have occured about 0.15 Gyr ago we have the unique opportunity to study this interaction in a very special short-lived stage, far away from thermal and dynamical equilibrium. As a result of the encounter, the collision-dominated hot plasma and the collisionless stellar and dark matter components have been separated. The galaxy components of both clusters are clearly offset from the associated X-ray emitting cluster gas. In addition, weak and strong lensing maps show that the gravitational potential does not trace the distribution of the hot cluster gas that dominates the baryonic mass but follows approximately the galaxy distribution as expected for a collisionless dark matter component. The likelihood to find such a high velocity cluster encounter in a LCDM cosmology has recently been investigated by Hayashi & White 2006 using the Millenium Run simulation. According to the newest extimates from X-ray and gravitational lensing results the likelihood becomes < 1e-7 which means that 1E0657-56 represents an extremely rare system in a LCDM universe. Recent numerical works by Milosavljevic et al. 2007 and Springel & Farrar 2007 have demonstrated that the relative velocity of the dark matter components associated to the main and the sub-cluster are not necessarily coincident with the bullet velocity inferred from the shock analysis. Moreover, due to a drop in ram-pressure after the cores' interaction the gas component of the sub-cluster can eventually be larger than that of its dark matter counterpart. We investigated the X-ray morphology of the "bullet cluster system" and derived the most likely impact parameters, mass ratios and initial relative velocities. We found that the the observed displacement between the X-ray peaks and the associated mass distribution, the morphology of the bow shock, the surface brightness and projected temperature profiles across the shock discontinuity can be well reproduced by offset 1:6 encounters where the sub-cluster has initial velocity (in the rest frame of the main cluster) close to 2 times the virial velocity of main cluster dark matter halo. A model with the same mass ratio and lower velocity (1.5 times the main cluster virial velocity) matches quite well most of the observations although it does not reproduce the morphology of the main cluster peak. Dynamical friction strongly affects the kinematics of the sub-cluster so that the low velocity bullet is actually bound to the main system at the end of the simulation. We found that a relatively high concentration (c=6) of the main cluster dark matter halo is necessary in order to prevent the disruption of the associated X-ray peak. Finally, for a selected sub-sample of runs we performed a detailed three dimensional analysis following the past, present and future evolution of the interacting systems. In particular, we investigated the kinematics of the gas and dark matter components as well as the changes in the density profiles and the motion of the system in the L-T diagram. For further reading download Mastropietro & Burkert (2008).